“My lack of coordination, clumsiness, poor gait, and lack of motivation has always been a hindrance to my participation and enjoyment of physical activity. Now, I try to remind myself of the benefits of exercise,” says Jim Dilmon who was diagnosed with autism spectrum disorder (ASD) at the age of 9. Children with ASD face many obstacles to participating in a regular fitness program due to challenges in communication, social interaction, and motor skills. Most fitness programs are not equipped to address these challenges because typical athletic programs require good social skills and adequate motor coordination including combinations of strength, speed, and balance. The end result is that these children are often extremely resistant to any regular physical fitness program and therefore lead sedentary lifestyles. This has resulted in the obesity rate being nearly 10% higher in ASD children than in neurotypical children. Ballroom dancing is a perfect fitness choice for autistic children because it builds on the strengths of the child with ASD by being a repetitive, one-on-one, visual activity. Ballroom dancing also provides a forum for ASD children to build the social and communication skills that are typically a struggle. This activity is also a great way to gain self-awareness and build self-esteem which are typically low in the ASD child. Dance Dynamics, through the Children’s Tomorrow Foundation, is seeking to design and implement an 8 week physical fitness program that utilizes the creative movement of ballroom dance. 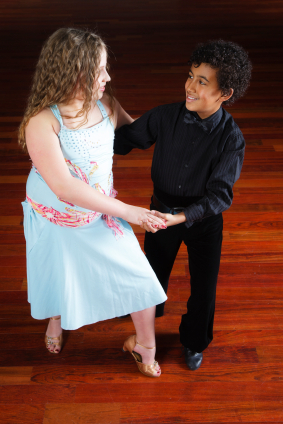 Children will be taught the steps and techniques in ballroom dance and partner with another child in multiple ballroom dances (rumba, cha-cha, swing, waltz, tango, foxtrot). The goal of the Dance Dynamics program is to provide approximately 12 Asperger’s syndrome or high-functioning autistic children in the Chicagoland area with the opportunity to learn basic ballroom dances in a safe and supportive environment. If you would like your child to participate in this program, please fill out the contact form on the Contact page.